Whose engine in this first ever Mod-Up deserves the coveted Brass Machine trophy!? I was thinking of having a go. Am I allowed to use a nut that fits the bolt or do I have to drill and tap the head of the bolt (or screwcut as I don't have a tap the right size)? Russell, that would be great. Don't worry about the bolt! If it's an engine made from pipe we'd all love to see it being built! OK. I've decided to have a go. I've never built an engine and this seems like a good enough excuse to try. I've got a few other things on at the moment so I don't want to spend a huge amount of time on it, so it will be a simple engine. Before settling on a design I reviewed the materials available. None of those gave me any immediate inspiration. So instead of spending hours on building an engine I've spent hours thinking about how simple I can make it. 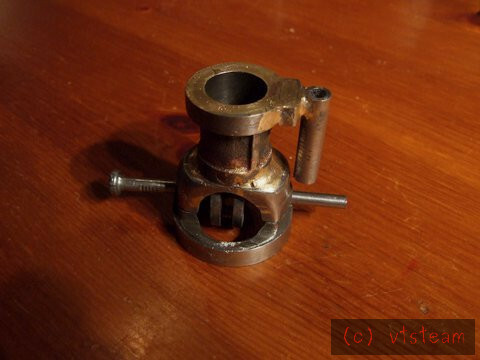 I thought about a simple steam (compressed air) engine with a bash valve but in the end I've decided on a wobbler. 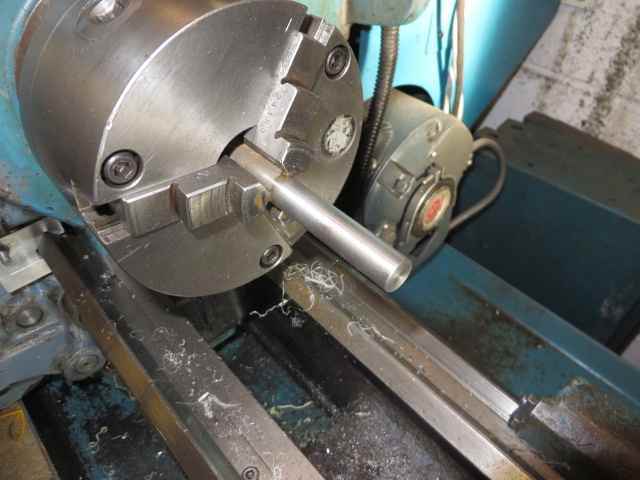 I'm going to use one of the short bolts and make up the missing length with some half inch bar. The only six inch bolt doesn't have a hex head which I think will be useful. First I made the cylinder. 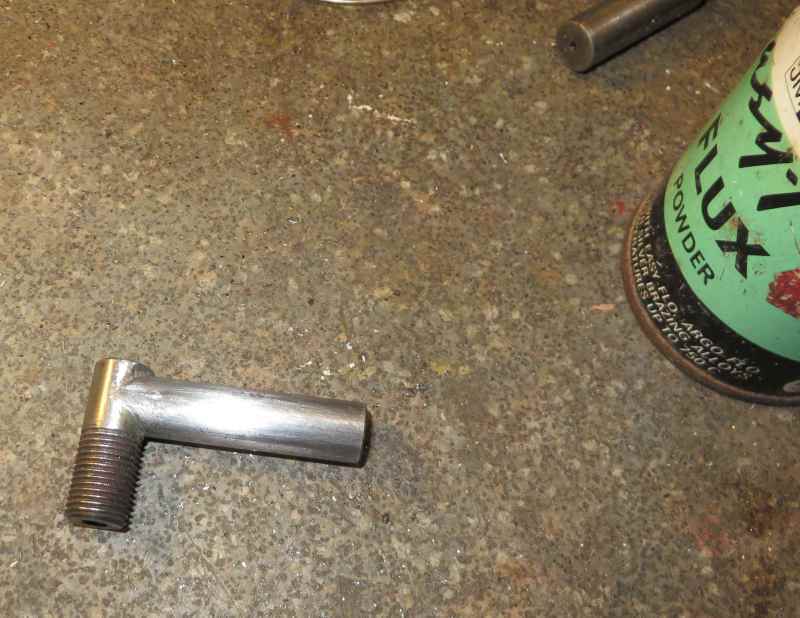 I scrubbed the surface rust off a bit of scrap half inch bar (an axle off a luggage trolley I think) and faced it. I turned it round faced and centre drilled. Drilled through and reamed. I was disappointed with the finish but a 3/8 bar pulled out with a satisfying pop so I decided to go with it anyway. I think the fit is OK. It moves freely until I block the end of the cylinder. 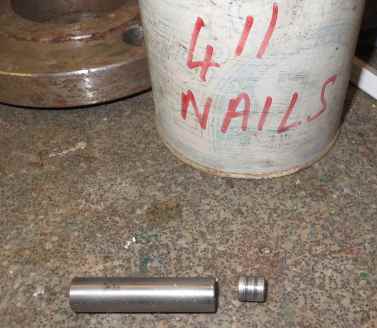 Here are the piston and cylinder next to a tin of connecting rods. Russell yer makin' the cylinder out of the bolt instead of a pipe?! Well I hadn't anticipated that one! "Here are the piston and cylinder next to a tin of connecting rods"
I hope they're 'guaranteed to do exactly what it says on the tin' ....OZ. You're looking at this from the wrong perspective . First he made the pipe outta' the bolt,then made the cylinder outta' the pipe that used to be a bolt,and next he's gonna' make the con rod from a nail that was made from recycled con rods .....See,it's all completely logical ,and no madness involved in it at all .....OZ. None of the bits of pipe I had smiled at me - or to put it another way I didn't have anything that looked like a piston that size. I did wonder at one stage whether I could make the whole engine out of the bolt. See,it's all completely logical ,and no madness involved in it at all .....OZ. But, I must say I'm loving, following along! 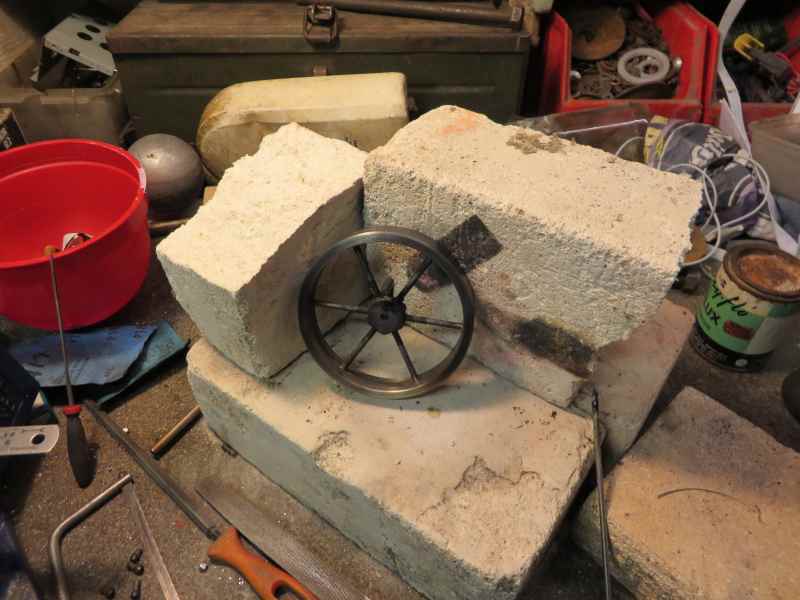 Personally,I think you should flatten the bolt in a forge and anvil, and then roll it into a pipe and squish that in the vise to make the nail for the con rod, then Bob's yer uncle! Why do people insist on doing things the hard way? Here's a bit more progress. 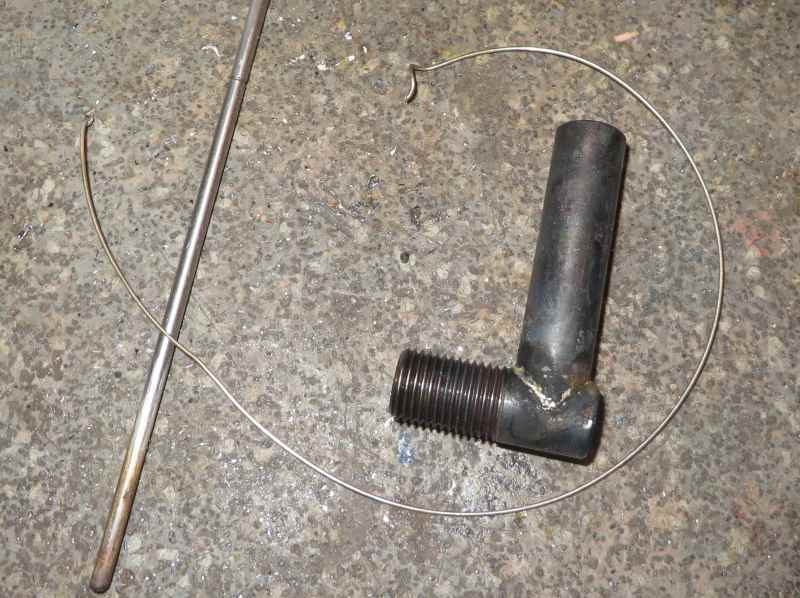 After an abortive effort at making the big end from the threaded part of the bolt a second one was made from the unthreaded bar. The con rod was shaped to fit the bush by hitting it with a hammer and then filing. It was fluxed and a couple of tiny bits of silver solder placed on the nail head with the bush on top. I heated it with the blowlamp, the silver solder melted, a little nudge with a rod to get it central and it was done. 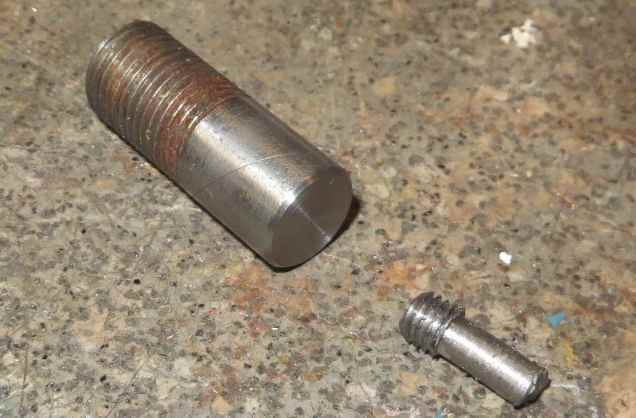 It was threaded with a die and the piston tapped to fit. The thickness of the nail will only give about 50% thread engagement but that'll be plenty. The cylinder head (part of the bolt) was drilled for a steam passage and tapped for a plug. A plug was made from another part of the bar. The stalk will be cut off when it's finally fitted. 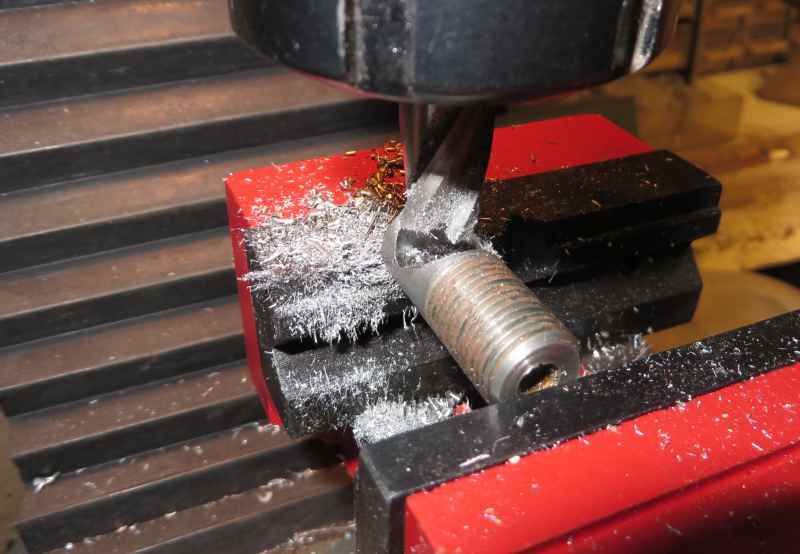 The cylinder head was drilled so that I could take a plunge cut with a half inch end mill. 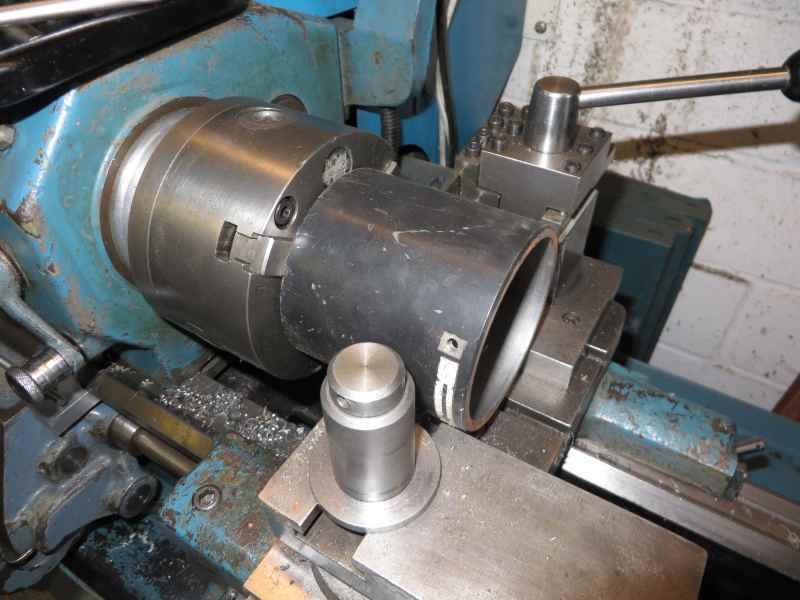 Then a pocket was milled out for the cylinder. This was a little more complicated than I expected. 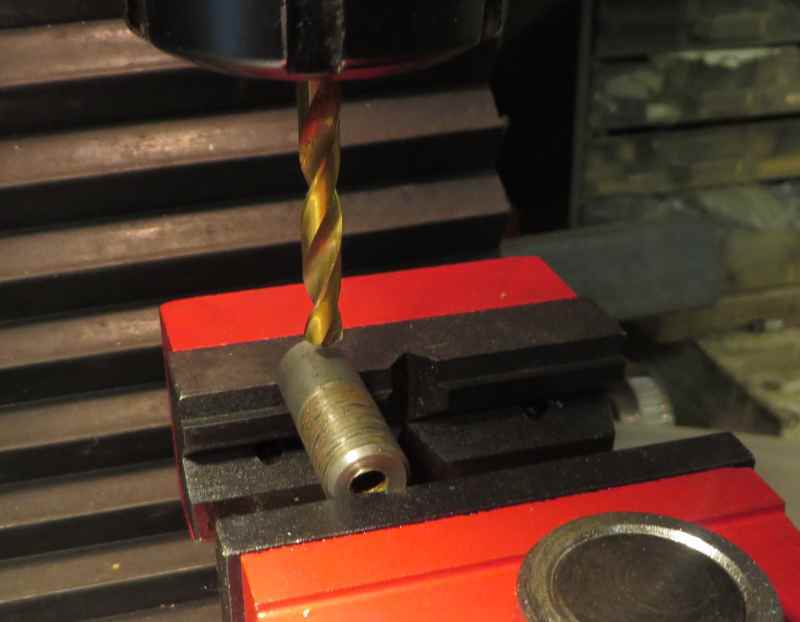 The end mill (clearly marked 1/2") wasn't so I had to wiggle it around a little. I think the reflection from the flash flatters in the last photo. It doesn't look that good in real life. Needless to say various things went wrong along the way. I was checking the length of the conrod and discovered that in my calculations for the steam ports I'd missed a factor of two somewhere. I had to shorten the conrod and redesign it a bit. I had to have three attempts at silver soldering the cylinder head to the cylinder, first it wasn't square and then it leaked. However it's all done now and the piston still fits. 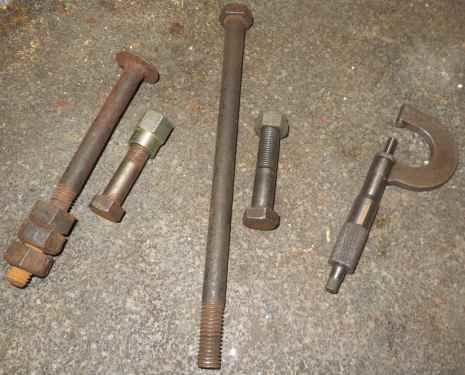 I've used a two inch bolt and that has provided the cylinder head and the cut off head of the bolt. I used 2" of bar for the cylinder, 3/8" for the piston and 1/4" for the big end and another 3/4" for the plug. Given the bits used just to hold bits for machining, parting off etc there is no bar left. I think the head of the bolt will be a hub for the flywheel. As an aside I've been thinking about flywheels. There is of course no reason why they have to be round and for a slow speed single acting engine I'm thinking it might actually be an advantage to be out of balance so that gravity can help with the return stroke. The steam ports are going to be the trickiest part of this. After my mistake with calculations the ports are very small and difficult to drill but I'm still thinking about that. You're not the only one moving back a step -- I decided the cylinder wall was just too uneven so tried reaming it, which worked, but the result was the piston is really pretty sloppy in itnow. So I have to make another piston. The cool thing about this project is you learn first hand what order to do things in, and why, and what goes into the design of an engine. And how to solve little construction problems. Even if in principle you think you already know. All the mistakes are better than second hand knowledge. I bet the next one either of us builds from scratch goes together a lot smoother. And imagine the luxury of being able to use regular stock materials! Though, sometimes I think.....it's overcoming the problems that make it fun. I had a teacher a long time ago, now deceased, who said "The more rules, the merrier." Back then, in the late sixties, I thought that couldn't possibly be true! But now I think I understand what he meant by that better. It's not the rules, but solving challenges within bounds that is the merry part. I turned a piece of a very large nail -- a spike, really, but somewhat bent. 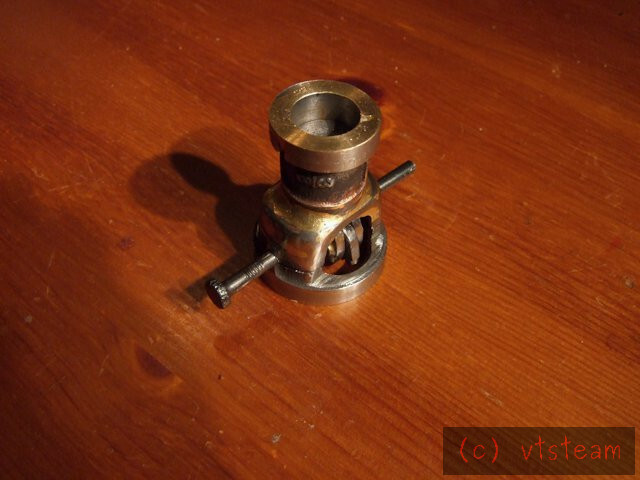 After turning straight I drilled it .192 to fit my other nails, then bored it and brazed it and a bit of cast iron to the top of the cylinder by way of a valve guide. You're right Steve - it's a bit like those jobs you do where you haven't got the right tools and have to work out how to do it with what you have got. On to the flywheel. 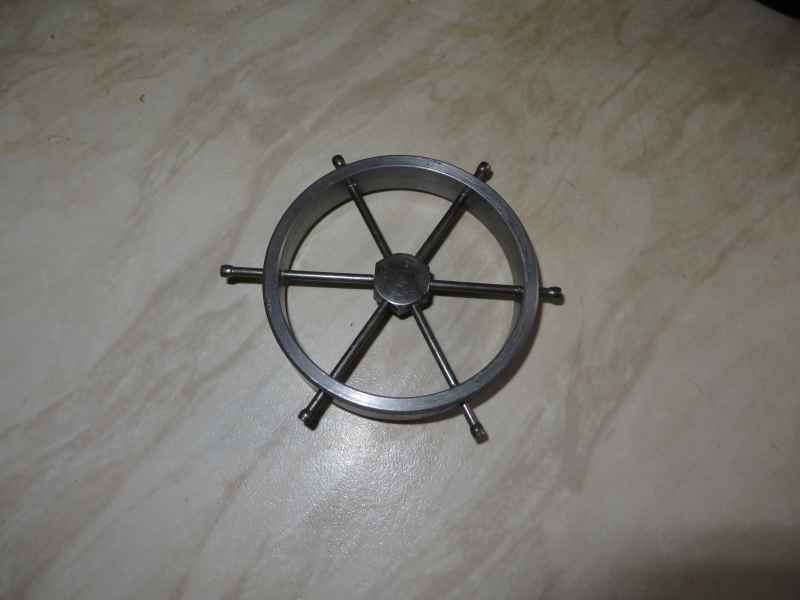 After thinking about unconventional (not round) designs for a flywheel I've gone all weird and decided to make it round. 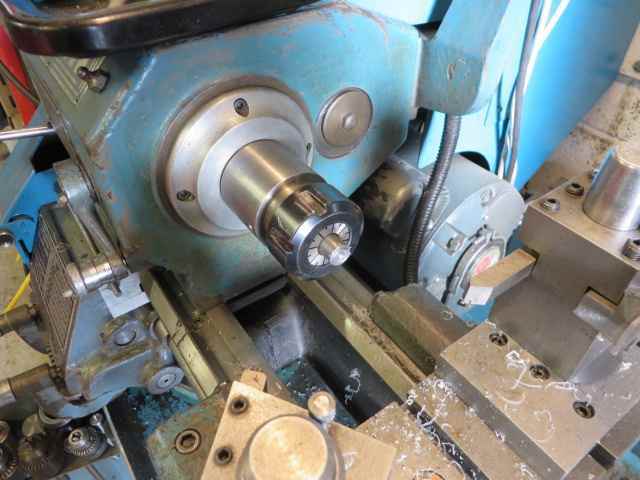 I took a large bit of tube (a scrap motor casing) and put it in the lathe. I'm using the rear toolpost and the tube just fitted in without taking the top slide off although I had to take the toolholder off. That's it done. I chamfered the edge while it was in the lathe. Here's the kit of parts. You can see the hub has been drilled with pilot holes for the spokes. 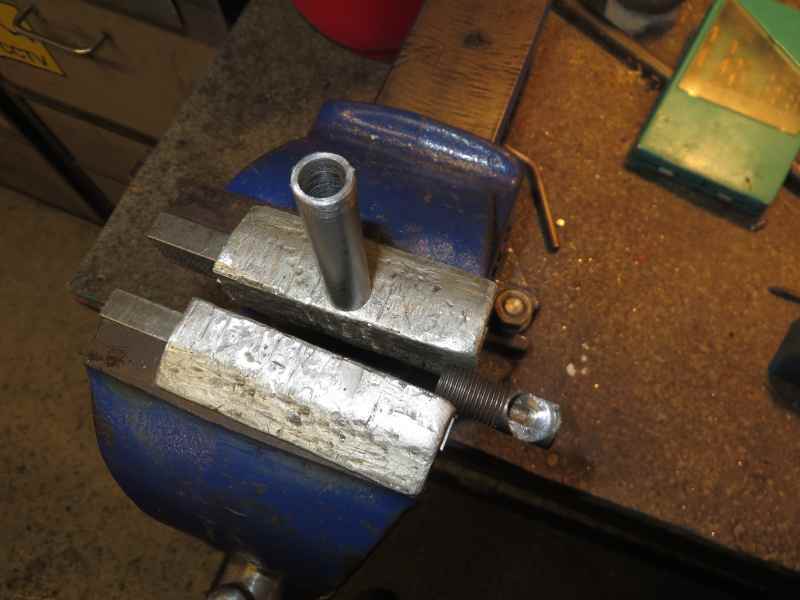 They were positioned by scribing lines from corner to corner on each flat of the bolt head. 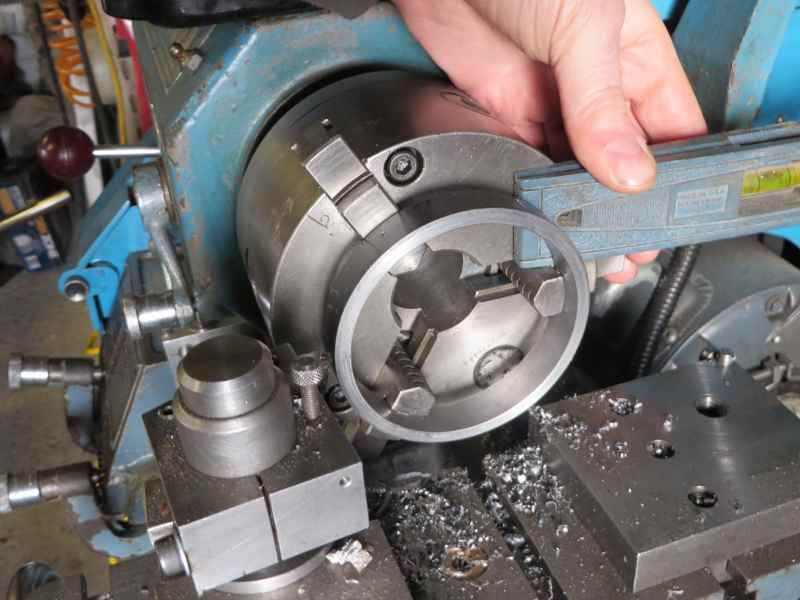 It was back to the lathe to set out the holes in the rim. This is my setup for dividing into 6. I used the lathe tool to scribe marks on the rim. The spirit level is used at front and back of the lathe. The next job is to fix it together. I think I'm going to silver solder it but loctite would probably be OK too. I've also (I think) solved the problem of how to make the steam ports. I've a feeling this engine might sound like a bag of nails when (if) it runs. Here's the rest of the flywheel. First it was silver soldered and taken back to the lathe - I decided that drilling it after it was assembled was more likely to minimise runout than trying to assemble it accurately. Then back to the bench to add a crank. Then cleaned it up and put it with the other parts. How you guys imagine these engine parts out of the original ones baffles me. My brain just doesn't work like that. I'm enjoying following along with this great idea. A most interesting project / challenge and I have been following with interest since day one. The problems and solutions plus the ingenuity of converting what many would see as junk into working junk. Oops! Bad John. I mean, hopefully Working Engines is well worth the wait. Thank you so much for posting. No one has made anything run yet Shipto. OK, now it's time for a bit of theory. The wobbler I am making has an unusual feature. I've never seen it before so please let me know if you have. 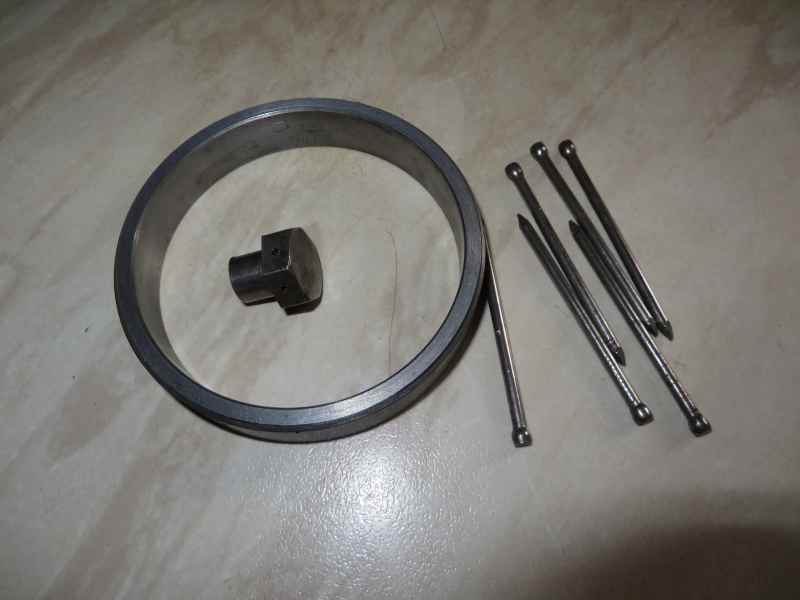 The unusual feature is that it uses the thread of the original bolt in the original nut to mount the cylinder, provide the bearing for the oscillation and to provide the sliding surfaces for the valve gear and a seal for the air/steam. 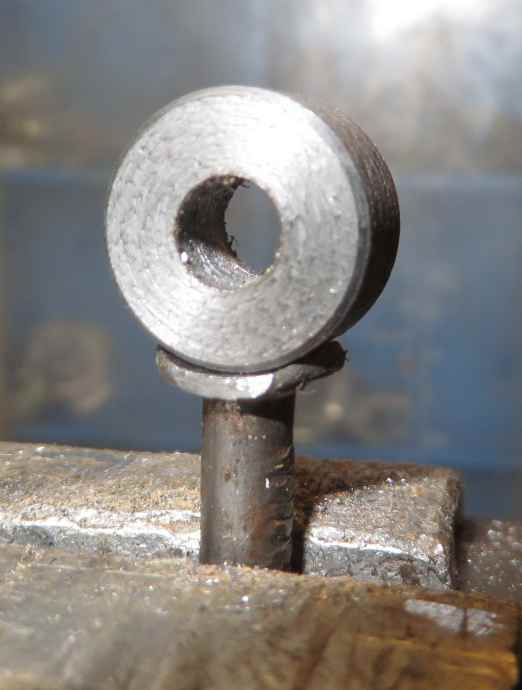 As the cylinder rocks back and forth, the bolt end rotates to and fro in the nut and with suitable holes drilled provides a valve action like this. This is where my earlier calculation mistake became a problem as when I calculated it correctly I discovered that the ports were only 1.4mm in diameter (less than a 1/16") and I didn't fancy my chances of drilling those without a much larger supply of drill bits. Note that the area could be increased if necessary by drilling multiple holes. After a bit of thinking I realised that the holes could be any size I wanted (within reason) as the dimension I'm concerned about is the overlap of the ports, not their diameter. So here is a revised version showing 3mm diameter ports. And here is a diagram showing how if I add an extra port and arrange the nut to rotate as well I can make the engine reverse. Unfortunately this has the inner ports at an inconvenient and difficult to lay out 118 degrees. So what diameter port do I need for a 120 degree angle? Back to the calculator. These calculations show a degree of precision that won't be achievable in practice. 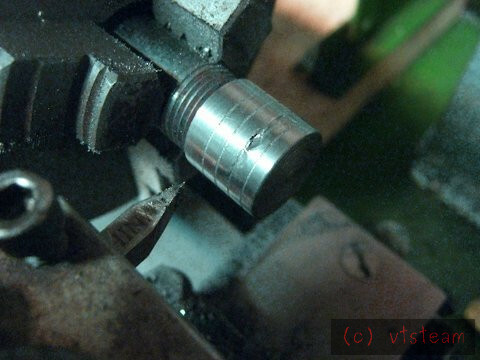 The mating surface is not flat - I'm using the pitch diameter of the bolt for the calculations. My plan at the moment is to make the ports undersize and creep up on the right size. I'm also wondering how much to separate the inlet and exhaust along the length of the nut/bolt. That is very cool Russell! 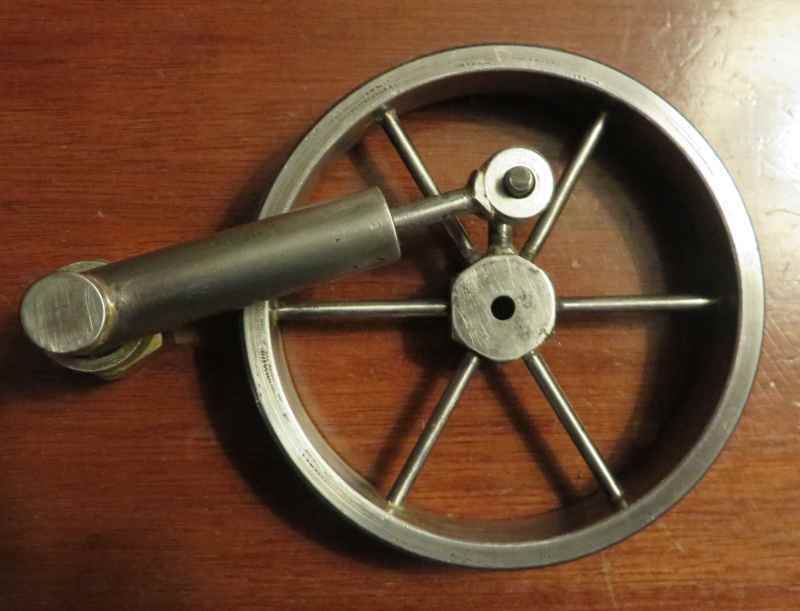 I'd call it a rocking valve oscilator with a screw bearing. What I particularly like is your reversing method. I think the challenge is going to be maintaining steam (or air) tightness around the screw threads, but I bet you work that out -- and anyway as long as it runs, it's an engine! All around clever and interesting!! 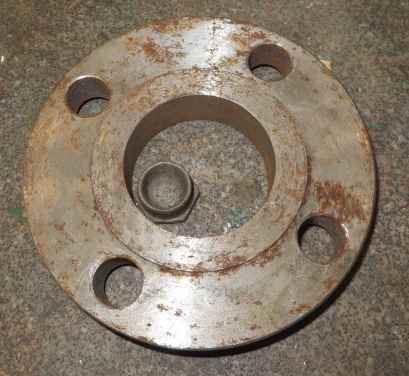 Shipto, don't stop now, man..... your flywheel is cool and you stuck with the challenge of pipe, which is hard to do. We all want to see it running on something! If it puts this for-fun project in perspetive, I had a bad day on mine yesterday trying to make a piston. I went to town to buy a few small pipe caps to turn and replace the piston that was too loose after reaming the cylinder. 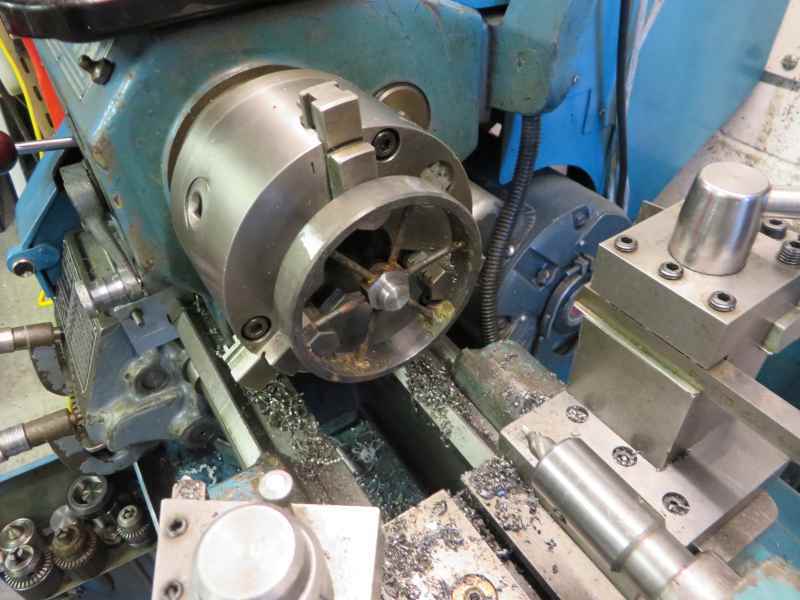 But the new one turned hard -- I got a lot of chatter in the lathe. So I actually worked on the lathe -- tightening the split sleeve bearing, and taking the carriage apart to flatten the gib and bearing edge. 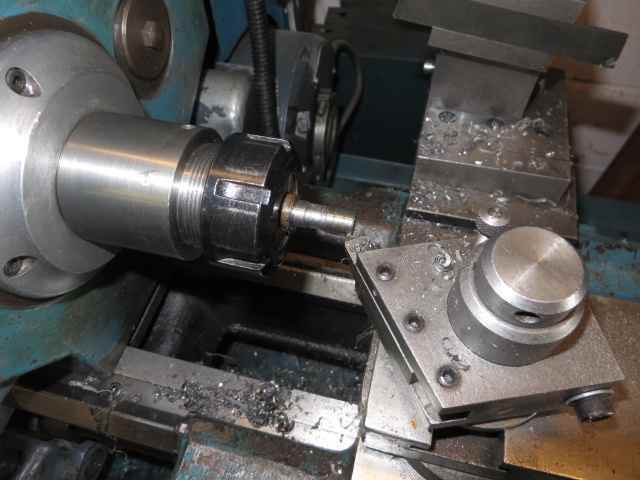 It was probably good to do, since the lathe had sat in storage for many years, but I was anxious to turn the piston. With everything back together, I was still getting a fair amount of chatter, even at slowest speed, and with a carefully sharpened tool. Probably the cast iron caps this time were harder than what I'd used before. 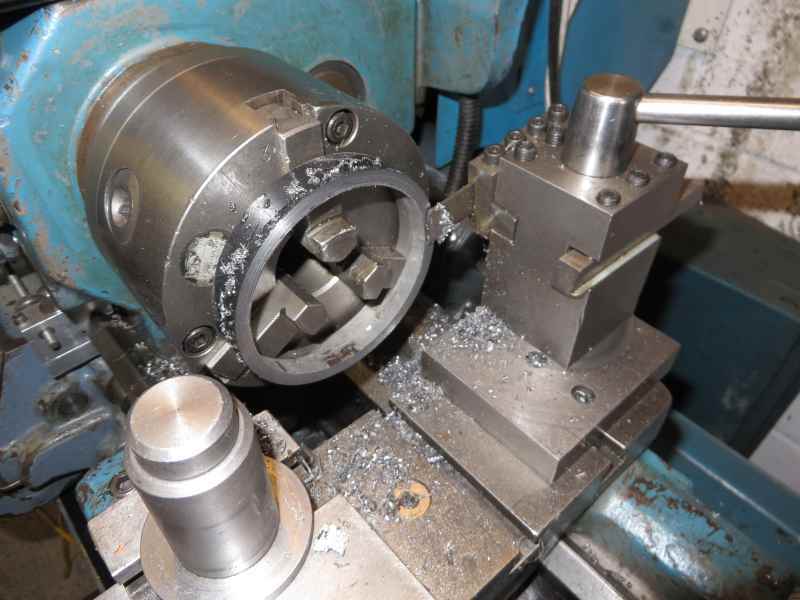 The other problem was that my 3 jaw chuck is just not well suited to the lathe -- it's quite thick, and with a backing plate the work is just held too far from the lathe headstock bearing for a 3/4" spindle to play nice with hard materials. 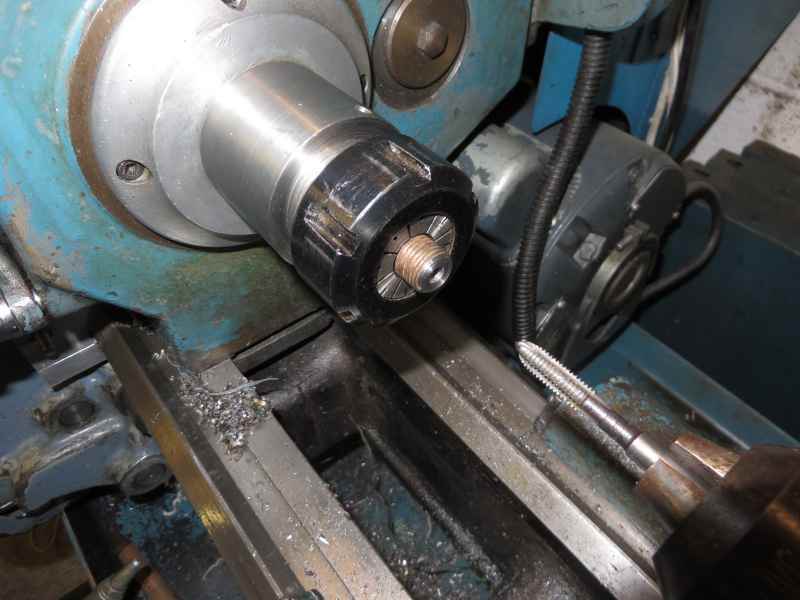 This became apparent when I brought the tailstock into play, and turned between centers. Chatter gone. Thinking I could finish the piston, now, I got it down to a perfect close sliding fit. 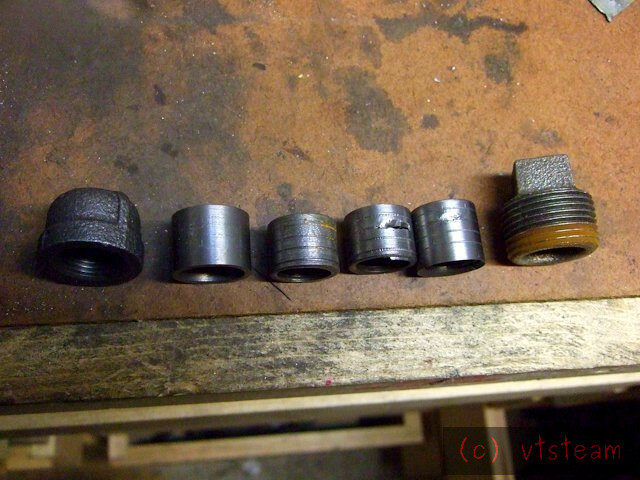 I turned off the end of the piston, and started putting in oil grooves, when, crunch -- I broke through the side. Not enough wall thickness! The new pipe caps were cored out much deeper than the old, past the threads. Part ruined, trip to town and 4 hours of fiddling with the lathe and then turning what I thought would be a great part. Oh well! Of course that wasn't an end to it -- thinking that maybe this cap had been cored off center, I proceeded to turn another one, and exactly repeat the same crunch. So I guess they are quite consistent, and obviously, so am I to a foolish degree! Piston#1 too big, but bored too soon so I couldn't reduce it enough. Piston #4 Crunched because I didn't trust the first crunch! And finally, a pipe plug, which might just have enough thickness to work. To add to the fun we have very cold temps today, and a super storm headed our way for this afternoon and tomrrow. Two storms actually, predicted to converge. We're expecting 20" of snow in 24 hours. So time to make the piston may be limited!